Sassy Lassie Reviews: Beauty Tip Tuesday! 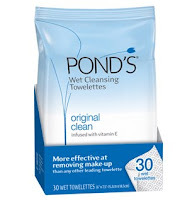 I LOVE the Ponds wipes... they are such a beautysaver as a busy mom (I don't know if I can QUITE say they actually save my life... but they certainly save my beauty! ).